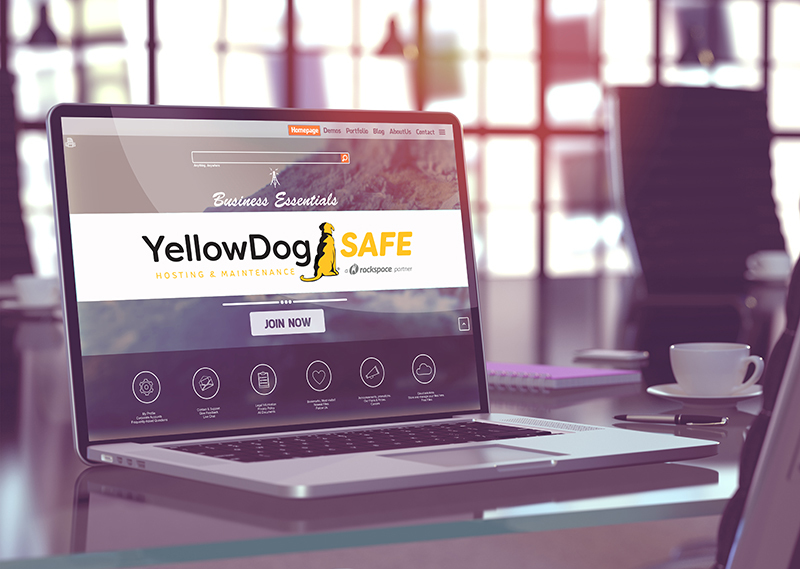 We are proud to offer a new service here at YellowDog – it’s called YellowDog Safe, and we’re your partner in web hosting and maintenance services! YellowDog Safe is a partnership we’ve formed with Rackspace, an extraordinary hosting provider that guarantees 99.9% uptime. With YellowDog Safe/Rackspace, you not only get the most secure, fastest, and premier web hosting services out there, but we also make you our priority! Do they even know who you are? YellowDog Safe is client-focused, which means you’re not just another account number to us. We know your business, your website, and your company, and we’ll treat your needs with the speed, accuracy, and respect you deserve! How fast do they respond? You can reach YellowDog Safe 24/7/365, we run maintenance checks on your site daily, and we post any website changes or updates you submit to us within the hour. We are 100% committed to keeping hackers at bay. What kind of bandwith do they support? YellowDog Safe offers the fastest speed at 198 GB of Ram (compared with other services that typically offer 2 GB of RAM). Most big-name services offer marginal data transfer speeds at best. This is key because your transfer speed is monitored by Google, and if you fall short, you get penalized in your SEO. If you’re an aggressive web marketer, SEO is everything! What effect are they having on your business? If your website is repeatedly getting attacked and infiltrated, or if you’re constantly having downtime (and getting alerted about it by your customers, eek), then it’s time to reevaluate your hosting services! As you can see, YellowDog does indeed host websites…but we have so much more to offer! With YellowDog Safe, you can have the security of knowing that someone is watching over your website and here to assist you at any time. If you’re interested in learning more about this great service, give us a call at 636-536-4477.